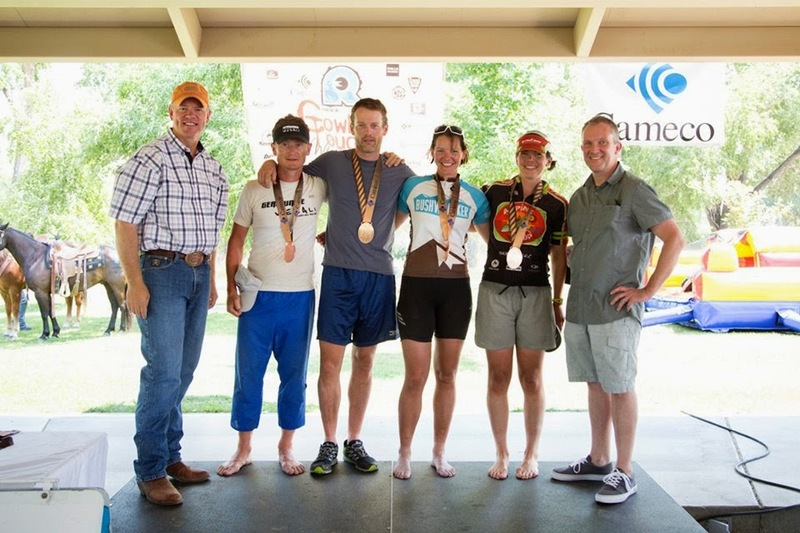 NOTE: This is the fifth in a series of posts about Cowboy Tough multi-day adventure race. I (Emily) worked together with my teammate Mike to write most of the text, and then Mike added in his own comedic flair in red italics. Enjoy! Andrei prepping his bike for the start of Day 4. Photo by Chris Radcliffe. 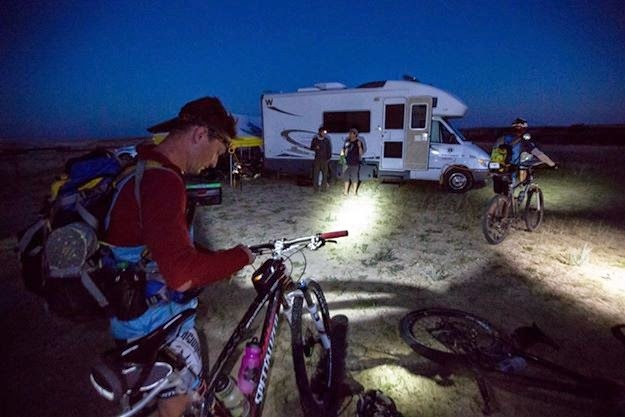 Our alarms go off around 0400 after a solid 4hr sleep and we go about preparing for our final day on the Cowboy Tough 2014 course: a 50-mile road ride into Casper where we will drop our bikes off at the finish line, then run a paved trail to the paddle put-in, and paddle back to the finish line through a man-made whitewater park on the North Platte River. We pack our bins up for the last time, load them onto Rev3’s Mobile TA, and get set for the day with a slew of other teams. 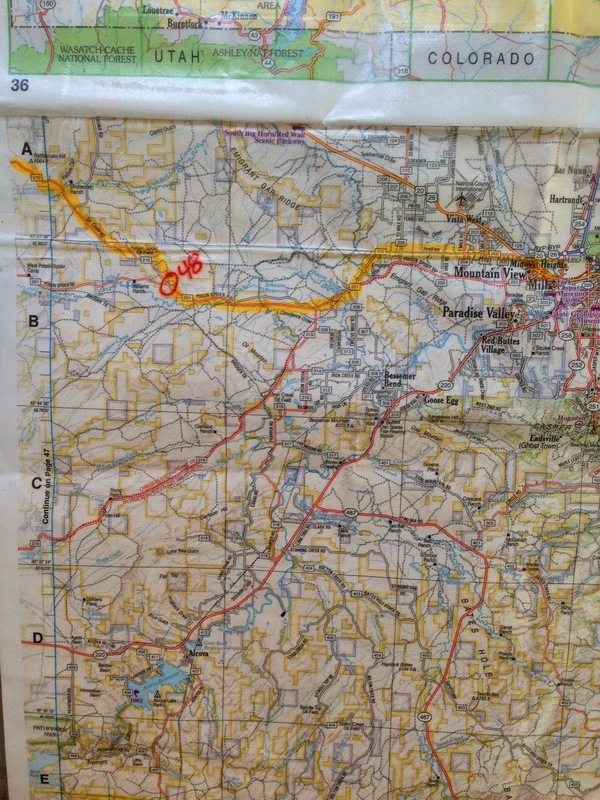 The final bike ride, 50mi on 1:gajillion scale Gazeteer map. We roll out on pavement in a tight pack with Tecnu, Columbia, and YogaSlackers, among others. Our new friends on the YogaSlackers help WABAR stay together by letting us in their draft from time to time. 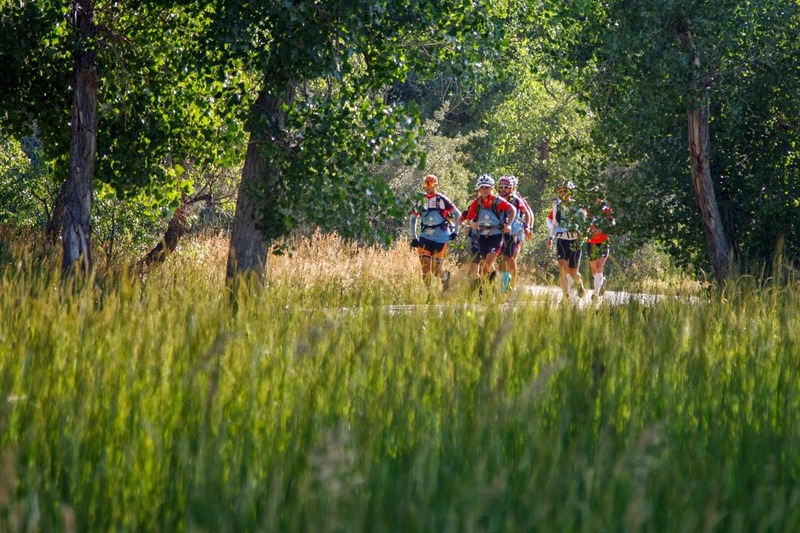 The pace is quite fast but by working together, we are able to stay in the main pack, laughing and smiling with exhilaration as the sun rises on a picture-perfect Wyoming day. And at this point we were experiencing a first for the 2014 running of Cowboy Tough (at least for our team). WE WERE ACTUALLY USING OUR BIKE LIGHTS. I spent considerable time debating my current battery stash and ultimately opted to invest in a monster batter for my Lupine. That thing could easily get me through the night (probably two) on full gas. And this was, quite literally, the first time I turned it on. 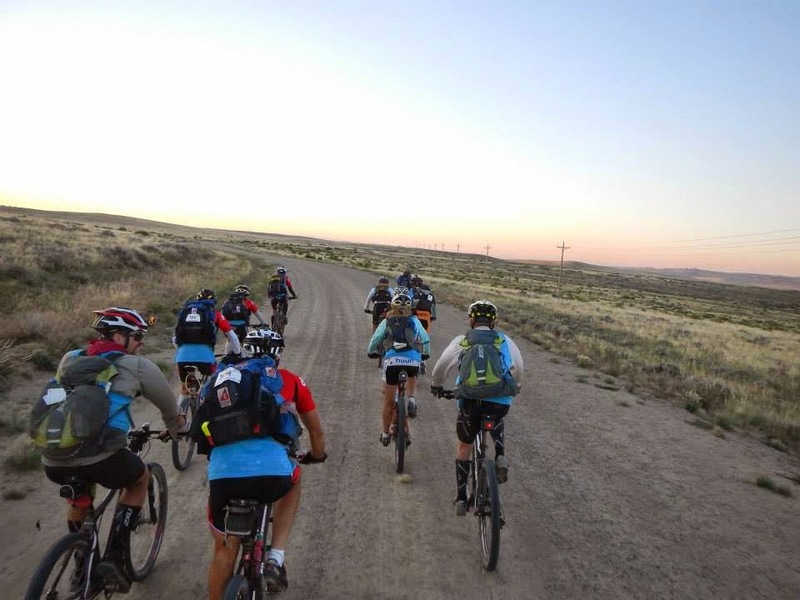 After several miles, the route turns south on some gravel and the pack breaks up a little bit, making drafting much harder and our effort levels rise. Anyone that has ever biked in a group is very familiar with this situation. Phase 1, full of adrenaline, “yeah man, I got this, I’m a beast, bring it!!" Phase 2, concern, “wow, this is pretty tough, I might need to get a little closer to that person’s back tire for more draft while my legs warm up”. Phase 3, implosion immediately followed by ejection off the back of the pack, (no quote for this part because you are generally hypoxic and have lost the ability to speak). Garrison and Rachel crushing it! It’s a difficult conundrum to face, and an even tougher one to solve for a 4-person team on day 4 of an adventure race, but luckily Garrison decides to run over a nail and puncture his tire, thus making the choice for us. (and avoiding Phase 3 above) We stop and fix the flat, then resume riding at our own pace. As we get back to riding, we weave through different teams we’ve met over the course of the race. It’s great to share a quick chat with everyone, and for several miles we hook up with the 4-guy team GUTS who are all from Wyoming. 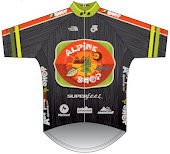 They give us the inside scoop on post-race restaurants in Casper, plus some intel on a good route back into town. We briefly scoot ahead of them, but once we reach Casper city limits, GUTS catches back up (probably due to Mike’s inevitable poop stop, yeah for real). (Despite my best efforts to resolve this before starting I had to make one more stop in a cow field before returning to civilization. What can I say, I’m exceedingly regular) GUTS then leads us the local way back to TA. It’s super fun to take the locals-only shortcuts, connecting sidewalks and bike paths with a few meters of dirt trails here and there. On one of the paths we see Tecnu and Columbia running so everyone gets a high-five...yee-haw! We reach the Start/Finish line with a cruel reality - the race isn’t over yet! We drop our bikes, but have a 5-ish mile run still to go, followed by the final paddle. In some consolation, we don’t have to bring any mandatory gear besides helmets, but Andrei still takes a pack for the team to carry everyone’s water. It’s pretty hot out and we can’t neglect hydration/nutrition even in the final hours. Tecnu and Columbia/Vidaraid on the run. Photo by Chris Radcliffe. As we “run”, we get glimpses of the whitewater features on the North Platte River, and they look a bit scary. Sure, they’re man-made, so that reduces the chance of weird underwater rocks and foot entrapments, but they still look harder than anything we’ve ever paddled in a canoe before. So we give ourselves pep talks as we shuffle along - “keep your eyes up” “find a good line” and “no matter what, KEEP PADDLING”. We finally reach the paddle put-in and experience a mixture of excitement and fear starting the final leg of Cowboy Tough. Just a 5-mile downstream paddle, how hard could it be? And for the first few miles, it’s NOT hard. The current is helping us out and, as Midwesterners, we’re plenty experienced in paddling canoes with our double-bladed kayak paddles. Final Day from Randy Ericksen on Vimeo. Except, it’s not nearly as bad as it could be, thanks to the continuing kindness of the GUTS team. They find Andrei and Rachel’s boat in the river before the 4th rapids, grab it, and haul it over to the riverbank where Andrei and Rachel are stranded. The six of them (4 GUTS and 2 WABAR) maneuver the boat around the rapids and get everyone situated just as Emily and Mike come through the splashy-splashy. What a relief! WABAR at the finish line of Cowboy Tough! Photo by Chris Radcliffe. When it’s time for WABAR to cross the finish line, we are arm-in-arm, exceedingly grateful that we are all still friends. As any team does, we had our tense moments out there that tested the strength of our partnership. But in the end, the pull of the finish line and the commitment to represent the Midwestern AR community was plenty motivation to stick it out and keep pushing forward. We finish Cowboy Tough in 4th place overall, behind a highly experienced podium - Tecnu (1st), Columbia/Vidaraid (2nd) and YogaSlackers (3rd). WABAR during the awards ceremony! Photo by Chris Radcliffe. 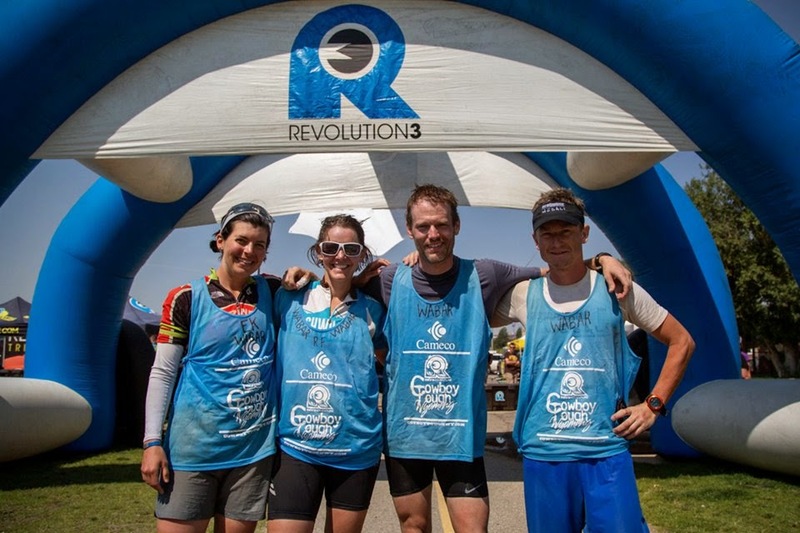 After we finish, Rev3 has provided a plentiful post-race buffet from Qdoba so we all load up our plates and chow down, socializing with other teams and even Wyoming’s governor! Our stomachs are so happy to be filled with real food, and we’re grateful that the weather is nice enough to just lounge around outside and be comfortable. We all start gradually checking back into the real world, turning on our phones that have been buried in luggage for the past several days. For Andrei, Mike, and Emily, it’s the usual emails and bookface messages popping up. For Rachel, it’s an entirely new level of emotion as she learns that one of her good friends in Arkansas has passed away after a mountain bike crash. This is difficult news to handle at any time, but in the physical and mental post-race exhaustion, it’s just too much. The news is hard on her and as a team, we try to do everything we can to help her cope, while at the same time sorting through gear and packing up for our flights back home tomorrow. Thankfully, Mike’s Dad is on hand to help shuttle people and bins, and even take us out to dinner! (It was very cool having dad there for a race, even if it was only the closing ceremonies.) We eventually get everything packed away, and hit up the local Dairy Queen with Tecnu, Silent Chasers, Adventure Capitalists/BDAR, and others for a late-night calorie binge. French fries and ice cream? Yes please. --We definitely did not expect to get that much sleep/down time between each day (2hrs, 6hrs, 4hrs sleep, plus extra off-the-clock time spent socializing and dealing with bins). I came into this race expecting to go straight through and having to manage our own sleep. If I’d known we’d get that much sleep I might have packed more comfort items in my TA bin. I’m a little disappointed about not having the chance at pure exhaustion, but overall, it was probably a good thing because I still have a lot to learn about TAing fast out of a bin. --We were super conservative on water/food and each of us probably carried way too much in that department. But, the goal wasn't fast-n-light...it was steady-n-smart. We definitely accomplished that. --I was very, VERY happy with how we managed our effort throughout the race. We only focused on our steady-n-smart goal and not other teams passing us. We all had our low moments but really nothing catastrophic, and they were never all simultaneous. This paid off big time as we were able to push hard late on Day 3. --Eating went well for me, although I packed WAY too much food. (Me too. Still working on the last of the gels I bought for the race…) Some of that was just a function of the course being short. Things that worked great for me on course: CR333, pecan sandies, dark chocolate/salt MOJO bars, flat pretzels. Things that were good in TA: Boost, Tortillas with dehydrated eggs, oatmeal, fruit cups. (Secret weapon form me, 3000 combined calories of dehydrated mac n’ cheese and Campbell’s Chunky Soup. Thank God for that 6 hours of sleep…) I never really got sick of anything, these were just extra good. --Not a lot of nav required for the race. That was a bummer, but we did sort of expect that. We were super proud that when there was actual navigation, we crushed it (fastest split overall in Hell’s Half Acre). I could probably write an entire blog post on my thoughts on this. As a teammate that generally provides value through his navigation skills this can be a tough one. It’s easy to feel marginalized when you’re not strong at all physically and all you have to do on nav is “not screw up”. 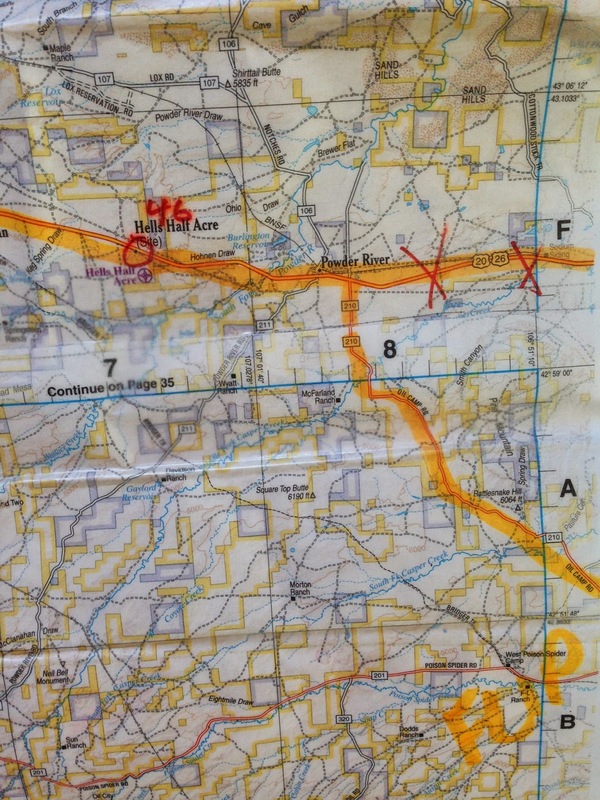 Then, at the nav crux of the race I folded and turned the maps over. But, I feel pretty good about being able to swallow my pride/ego and let Andrei work his magic. Which he totally did! --I’m surprised more teams didn't run CX tires. I thought hard about it but at the last minute ran out of time. Even with the advertised singletrack (that didn't actually make it into the final course), I think CX tires would have been way faster because there was so much road riding. I've loved reading all of your CT installments. You guys had a great team out there!